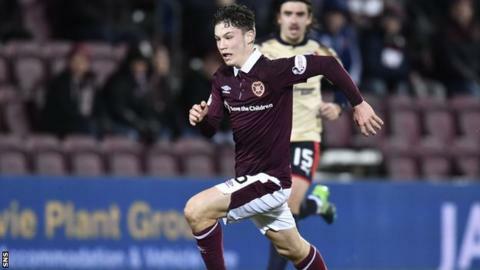 Hearts manager Craig Levein says he is "surprised" that Harry Cochrane and Anthony McDonald broke into the first team at 16 but always believed that they would make the grade. McDonald made his debut in the 2-0 win over Dundee, while Cochrane has made seven appearances for the senior side. Along with Lewis Moore and Jamie Brandon, both 19, academy players have come to the fore in recent weeks. "They have been training with the first team since the summer," Levein said. "The players know them and trust them, they will give Harry and Anthony the ball in really tight areas and expect them to deal with it. And they do." Cochrane came on as a first-half substitute against Dundee - and has played in the Edinburgh derby, at Easter Road. Fellow midfielder McDonald created Hearts' opener, for Isma Goncalves, at Tynecastle on Tuesday and delivered the corner kick that eventually led to Christophe Berra's second goal. "I believe in them," Levein said. "The first-team players believe in them. They train every day with the first team. "It's not like they have been parachuted in out of nowhere and our players don't know them. "They have surprised me a little bit by the fact they are playing at this age. I did expect them to be absolutely first-team players." Levein's side have now enjoyed back-to-back wins at Tynecastle and the manager hopes the players will carry that confidence into Sunday's visit of Celtic. "It was a good night," Levein said. "We kept a clean sheet, Christophe gets on the score sheet along with Isma. "They are feeling good, which is more important to me than Anthony and Harry feeling good. "We have had a tough couple of months and I'm hoping that's us turned the corner. We'll see."